In a letter addressed to Cook, House Energy and Commerce Chairman Frank Pallone (D-NJ) and Representative Jan Schakowsky (D-IL) inquire about the origins of Apple's Group FaceTime bug and its impact on customer privacy. Pallone and Schakowsky also ask if there are other flaws in the videotelephony product that have not been disclosed to the public. Last week, reports of a massive FaceTime flaw surfaced on Twitter. 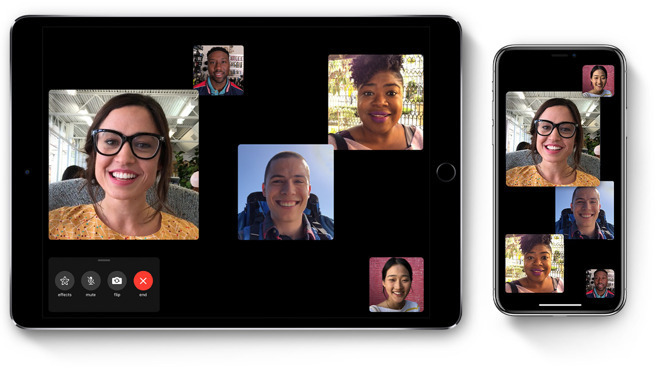 Impacting current versions of iOS up to the latest iOS 12.1, the bug enables a FaceTime caller to eavesdrop on another user before they pick up the call. In some cases, brief access to a receiving party's camera is also granted. Grant Thompson, a 14-year-old from Tucson, Ariz., independently discovered the flaw during a "Fortnite" gaming session in late January. Thompson's mother Michele attempted to inform Apple about the bug over the ensuing week, going so far as to file bug reports with the company. Whether Thompson's reports were lodged through official channels is unknown. Pallone and Schakowsky in their letter ask Apple to detail the timeline of events leading up to the discovery of the FaceTime flaw, what actions were taken to address the issue, what procedures were in place to safeguard against such vulnerabilities and how they failed, what safeguards are now in place as a result of the discovery and why it took Apple so long to respond to Thompson's bug report. The letter also requests information regarding steps taken to determine whether customer privacy was violated and, if so, whether the company intends to compensate users. Apple is asked to respond to Pallone and Schakowsky's questions in writing by Feb. 19. Honestly, I get that it’s a serious bug, but that’s all it is. How is it different from any of the other security flaws in PC’s/Macs/Androids/iphones/etc that are discovered on a regular basis? Except for the fact that Apple closed the hole by shutting down the server almost as soon as it was discovered. Uhhhh, many people died from faulty GM ignitions and it took them like a decade to fix it and let's not even talk about the deaths and injuries associated with faulty air bags that are still in millions of cars in the US. A corporation this large cannot! move like some 1000 employee company where everyone drops everything. There are systems in place to ensure that something even worse doesn't occur in haste. Think of it like a false alarm in Hawaii where someone is pressing the launch button because we want to act quickly. Noooooooooooooo! As if Apple needs to drop everything as soon as someone files a bug report. I think 2 weeks is PDG in addressing the bug. Nothing to see here, move along. This wasn’t vulnerability dicovered by a well known security agency through an organized Pwn2Own type of initiative. It was reported as a bug by a teenager and his mum, likely through some high-volume general feedback mechanism. It could take several days for a staffer to even look at it, and it likely wasn’t thoroughly documented so as to easily be reproducible. That being said, I’d be interested to know the gap in time between their realization of the scale of the bug and the first communication. Group FaceTime shut down the same day the bug was Publicized. It was discovered at least a week earlier. That's pretty quick by most bug report standards, but slow for the severity and how easy it was to demonstrate. Are these imbeciles for real? The existence of Google and Facebook alone should negate all this false concern. Good Lord. I doubt the Congresspeople have any real understanding of the process of tracking down and fixing a bug without interrupting the rest of a program's normal functionality, but they are about to get schooled in that and any education from Apple on how things work to the luddites in Congress is not a bad thing (though the showboating isn't necessary). Now that lawyer in Texas, OTOH is peeing into the wind with his case. An "interloper" can't have eavesdropped on an established FT call without the lawyer **accepting the interloper**, and the lawyer would also have a record of who it was, since that would appear in the FT log. So, no, Texas liar, your scenario didn't happen. Once the case is dropped, he or she should be reported to the Texas Bar for unethical behaviour. Great. Now can they do something to those with real data breaches, like Equifax? More technologically inept individuals trying to posture on a complex technological concept. Software development and QA is not for everyone. Let the pros do their job and move along. Jesus man.. The house members should find something more important to do. Really asking Apple about a damn bug. I will refrain from making a political comment but government is now a effing waste. Not only that but if it was a mention in a tweet or an email, how many of those does Apple get daily? How many employees are monitoring social media for bug reports? The right people have to be notified. Apple employees aren't a collective mind. Well, they did have a bunch or hearings where people got to grandstand and afterwards .... did nothing. difference is that Apple was notified but the woman hadn't notified the right group. sounds like she sent a message to the general feedback off the site or something about as vague and it took several days for the information to get to the right group to figure out what exactly the flaw was. meanwhile said woman, apparently made that Tim Cook didn't personally call to offer her a fat reward, announced the flaw on social media. and THAT is when folks knew it existed. and Apple shut down the server within like 24 hours. Congress knew about the issue for a week, publicly knew, and did nothing.